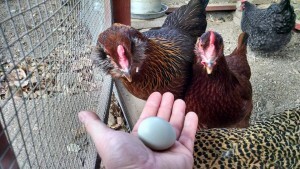 Yesterday I found the first egg from my Sicilian Buttercup hen. 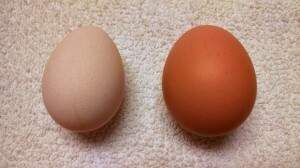 It’s the one on the left in this image, the right one is from my Rhode Island Red. The hen lights which I installed appear to be paying off. I’ve got the lights coming on at 5:35 AM, which gives the hens about two hours of daylight that they wouldn’t otherwise have this time of year. 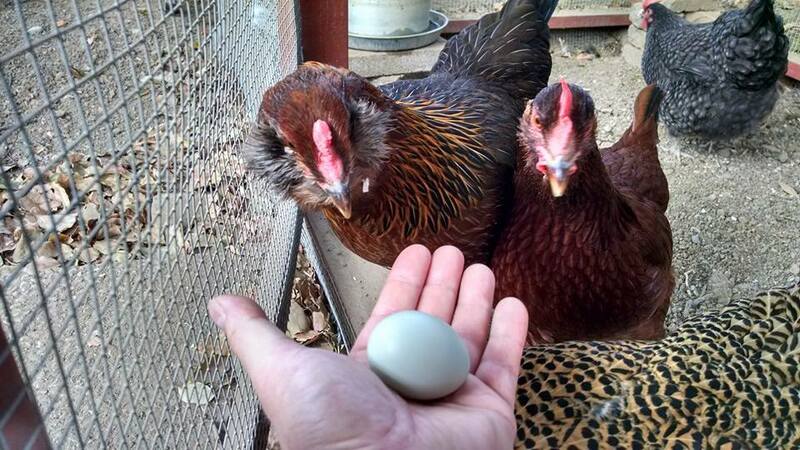 The literature indicates that this should stimulate better egg output, and first indications are that this is working as intended. Buttercups aren’t really known as spectacular layers, but it’s good to have her getting started. The Ameraucana and Marans hens are still off duty for the season; I’m hoping they’ll start laying again with the added light. UPDATE: And The Marnas Too! 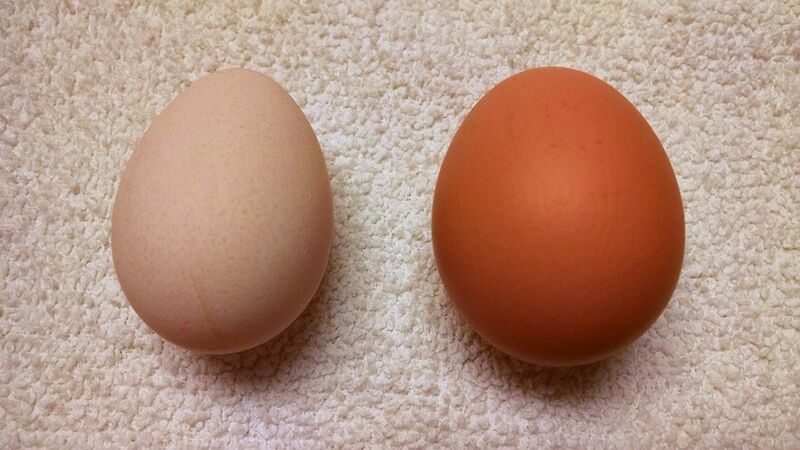 I came home today and found a Red egg and one from the Marans as well! The hen lights are without a doubt doing the trick. 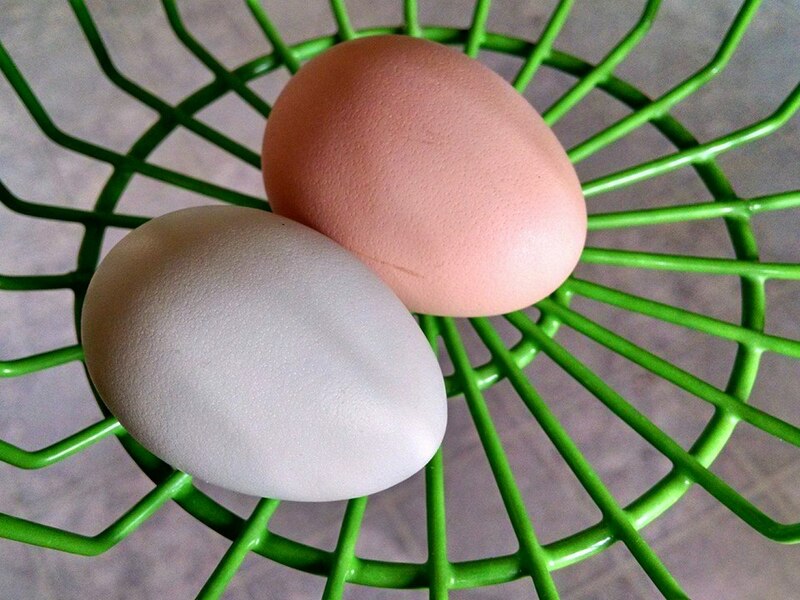 Lay well, oh hens, your tasty oval fruit! at such unseas’nable a time as this! 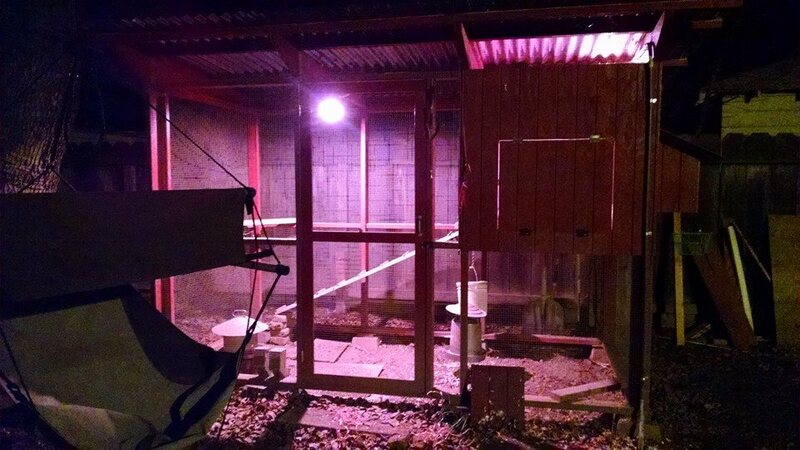 I’ve finally got the lights installed and working in the chicken coop! I had to make a last-minute trip to Home Depot 20 minutes before closing time, but it was worth it! The point of all this wiring is so that I can use artificial light to extend their day length. Chickens lay best with 15 hours of daylight, but at this time of year in San José the days are only about 9 ½ hours long. I’ve now got the coop plugged in to the same timer that I made to control the heat lamp in their brooder when they were just wee little chickadees. The lights that I installed are AgriShift poultry barn lights from Once Innovations. 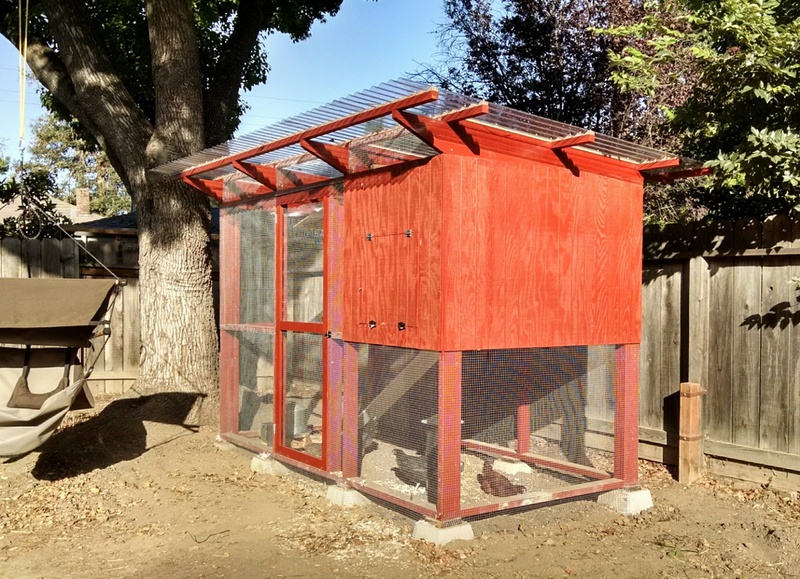 I’ll have to make some modifications to my controller in order to take advantage of the spectrum shifting features, but now that they are installed and working I can start the chickens on an earlier morning schedule than the sun alone would otherwise allow. Spring is springing early this year in my back yard! By the way, in case you were wondering the answer is yes; I do all of my electrical wiring in iambic pentameter. 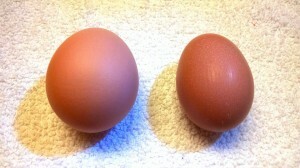 My Rhode Island Red Is Laying! It’s been a while since I posted a chicken update. Things are going pretty smoothly out in the coop, although the days are much shorter now than they were in the summertime. My Cuckoo Marans hen has stopped laying on account of the reduced daylight hours, and the Red and Buttercup didn’t get started before the days got short. According to what I have read, if hens don’t starting laying during the summer then they may wait until the following spring. I have been working on adding some artificial lighting to the coop to make the days longer for them, but that project isn’t finished yet. As a result of this situation, I have been down to only one laying hen for the past several weeks. Imagine my surprise this morning when I went out to check on the ladies and found a light tan egg which can only be from my Rhode Island Red! I’m excited that she’s decided to start laying! 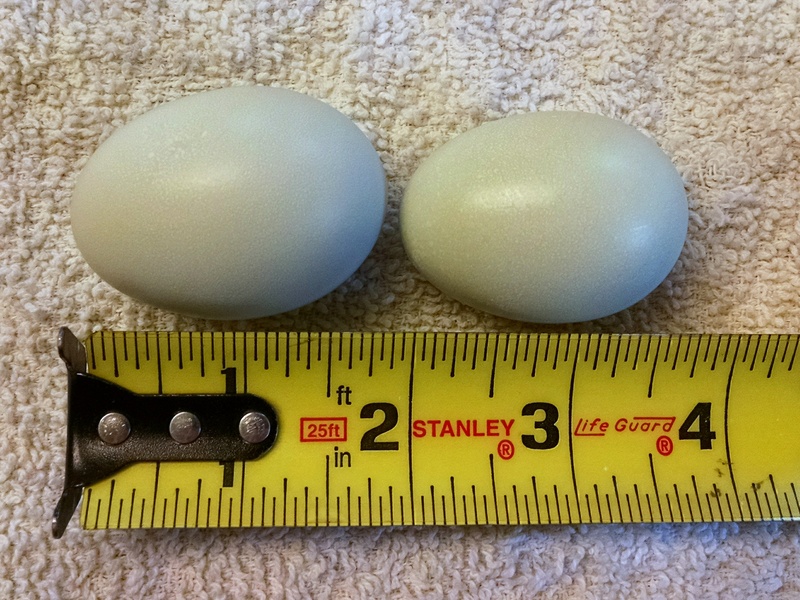 Her first egg weighed in at 1.75 ounces, which is just barely a USDA “medium”. I had been planning on going up to Grass Valley today, but the forecast was for a 60% chance of rain so I reconsidered. Instead of working on the barn, I stayed in San Jose and installed the nest boxes on the side of my chicken coop. 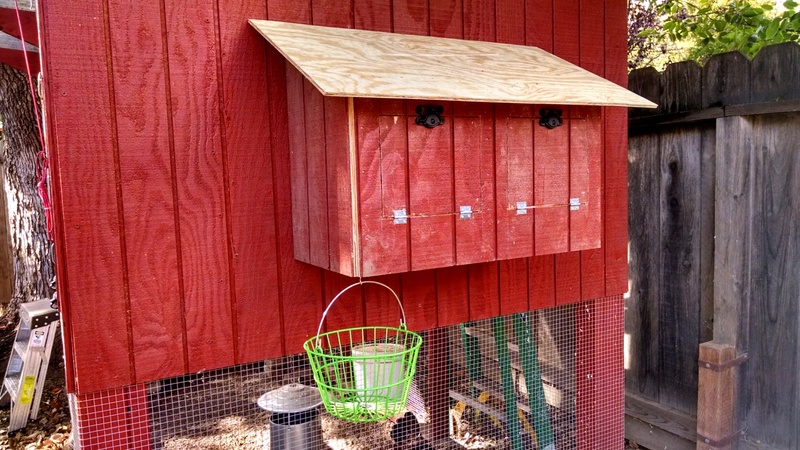 The boxes could use a second coat of paint and they need a shingle or two on the roof, but they are installed and ready for some chicken business. The crazy chicken lady recommends curtains on the boxes, which seems kind of silly but it might be a good idea. The coop roof is transparent, so there’s lots of light which I’m not sure a nesting hen would appreciate. I’ll see how they behave once they get the hang of their new accommodations. 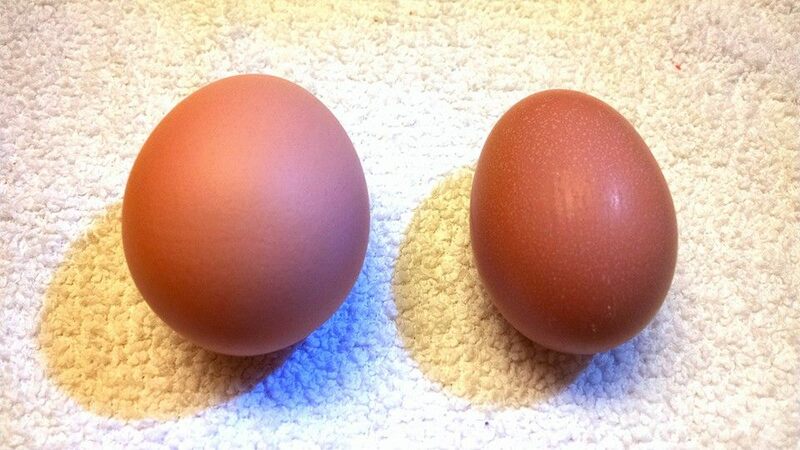 Well, one hen has started laying anyway. I went to check on the chickens this morning and I found two small eggs which look to be from the Ameraucana. The shells and membrane were quite robust. 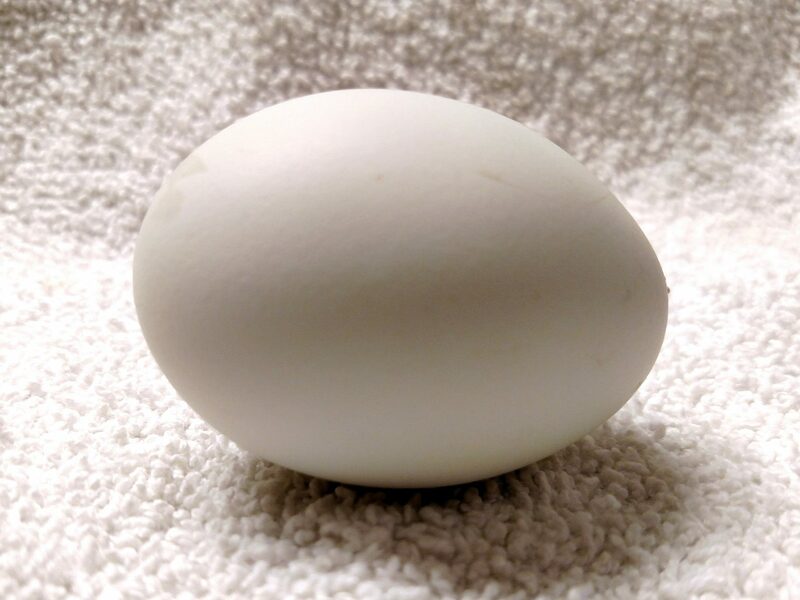 I’ve heard that they can start out thin, sometimes even laying an egg with no shell at all. These were just fine. The Ameraucana is 20 weeks old now, so she’s more or less right on schedule. The other girls are 19 weeks. 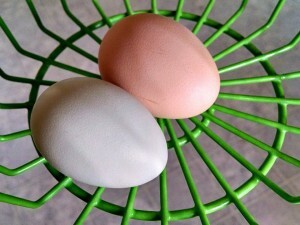 I expect the Red ought to begin laying pretty soon, but the Marans and the Buttercup may take longer. The chickens are doing well. They’re about eleven weeks old now and they seem healthy and happy. Here they are eating some tasty scratch grain mixed in with their regular feed. I’ve still got them on starter/grower feed. They should be switching to layer feed around late september or in october. Today is Day Three of the mostly-completed poultry habitat, and the girls seem to be enjoying it. They aren’t particularly enjoying the weather, with a high of around 90 degrees yesterday. They spend a fair bit of time laying down in the shade. Yesterday I built a pop door for them, and I think it turned out pretty well. I rigged a bit of line with some tiny half-inch pulleys so that I can open and close the door from outside the run. It works great! They are still a bit timid about the ramp. I clamped a 2×4 near the top so that they have a spot to stand when entering and exiting the coop, and that seems to have helped a little. I think the slope is a bit too steep for them to get sure footing. 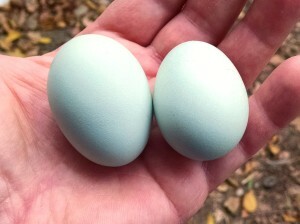 I had to put them in the coop by hand again last night, except for the Ameraucana who is a week older. I hand carried the three younger girls inside, and once the big girl figured out that she was all alone in the run she managed to find her way to her broodmates without my intervention. So there’s some progress in that department. 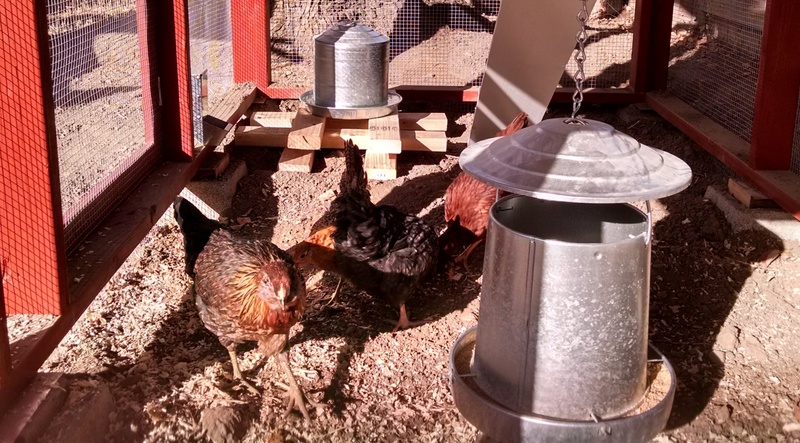 I noticed an interesting behavior regarding evening roosting: Out in the run, at evening time the girls will look for something to roost on the way chickens are supposed to do. Once they are up in the coop however they don’t have any interest in the roost which I installed for them and they instead try to all pile up on top of one another in the corner of the coop. So far I’m at a loss to figure out what is motivating that activity. The Poultry Habitat Is Open For Business! 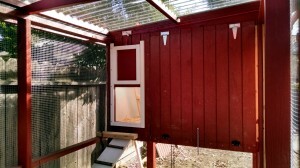 I finally finished up the chicken run yesterday with the installation of the door. The chickens are now fenced in! This morning I built a ramp for them so that they can get up and down, and for the first time I let them out of the coop! They seem to be enjoying themselves. It took about ten minutes for them to venture out into the big world after I opened the door. They didn’t use the ramp, they just sort of flapped themselves down to ground level. I’ll have to keep an eye on them today to make sure that they figure out how to get back up into the coop. I moved the feed and water down into the run, which is where I’ll be keeping them. The pop door isn’t built yet, so for the time being I’m just opening the side access door for the chickens to get in and out.